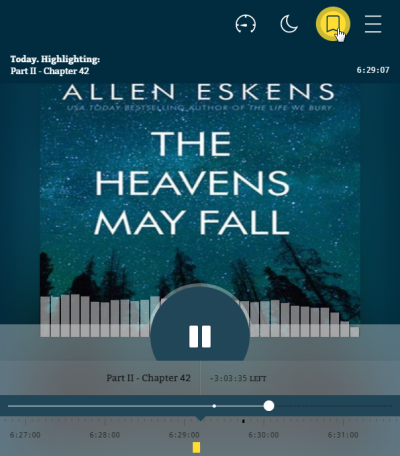 With OverDrive Listen, you can listen to borrowed audiobooks right in your web browser with a single click. There are no downloads or software required; all you need is a compatible web browser. Swipe right on the book jacket to rewind. Swipe left on the book jacket to jump ahead. The farther you swipe, the further you jump. Note: This feature is only available in Safari, Firefox, and Chrome. Click or tap to switch between common playback speeds. Drag down on the button to select a more precise speed. Click or tap to set a 30 minute sleep timer (by default). Drag down on the button to select a different sleep timer and make it your default. 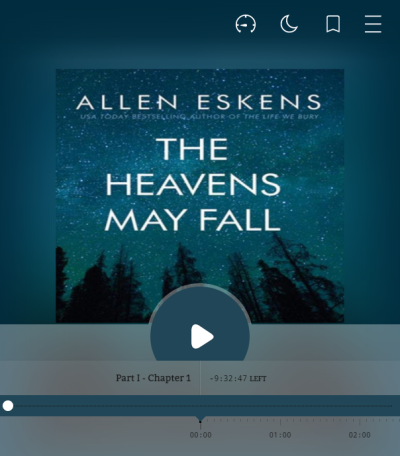 You'll find the menu icon in the top-right corner of the audiobook player. History: View a list of places you've visited during your current listening session. You add entries to this menu by opening a bookmark, scrolling, or selecting a chapter. Click or tap to add a bookmark. When you release , the highlighter colors will appear. You can also Make a note on a highlighted passage or a bookmark. You can remove a bookmark or highlight from the Bookmarks section of the OverDrive Listen menu. To do so, click and drag or swipe left on a mark and select Remove.